Proposed constitutional amendments to allow foreign ownership of land in the Maldives will allow China to establish military facilities in the Maldives and destabilise the Indian Ocean, a source within the main opposition Maldivian Democratic Party (MDP) has said. The amendments will allow foreigners who invest in a project worth more than US$1 billion to purchase land, meaning it can facilitate “foreign non-commercial logistical facilities” on such plots. Since the ruling Progressive Party of the Maldives (PPM) holds a majority in the parliament, the government can allow and regulate military activity on such land through other legislation, the source who wished to remain anonymous said. In a more carefully worded statement shared with the media, the MDP said: “Being a center right political party, the Maldivian Democratic Party in principle believes in free ownership of land and property. Nevertheless, the amendments can facilitate foreign non-commercial logistical installations in the Maldives. The amendment will be put up for a vote today. A three-fourths majority or 64 votes is required to amend the constitution. A total of 62 MPs voted to accept the amendment at midnight on Tuesday at an extraordinary parliamentary session. Parliamentary standing orders have been amended to fast-track the process of passing a bill into law. PPM MPs were not responding to calls at the time of going to press. Majority leader Ahmed Nihan said last night that the amendments will not affect the Maldives’ sovereignty, while MP Ali Arif said no land will be given for military purposes. The ruling party says the amendment would increase economic growth and facilitate sustainable investment in the Maldives. President Abdulla Yameen has declared a foreign policy shift to the East last year. Chinese president Xi Jingping was the first head of state since Yameen assumed power and the first Chinese president to visit the Maldives. During the visit, the Maldives agreed to become a partner in China’s maritime silk route, a trade route from China’s Fujian province to the Mediterranean Sea via South Asia and East Africa. 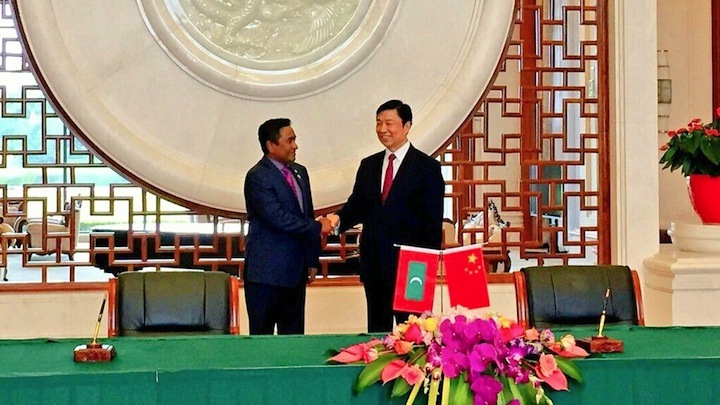 China is providing grant and loan assistance to the Maldives to build a bridge between the capital and the airport. Chinese companies are involved in airport development and have now been handed islands for resort development. Several independent and opposition MPs voted against the amendment last night, contending it will allow the government to sell the Maldives off as it gives unprecedented access to foreign parties to operate in the Maldives, especially with the enactment of the Special Economic Zones (SEZ) Act last year. The SEZ Act gives investors and developers major tax breaks and exemption from regulatory provisions in financial, environmental and labour laws. At the time, the opposition contended that the SEZ law would pave the way for money laundering and other criminal enterprises, undermine the decentralisation system and authorise a board formed by the president to openly sell off the country without parliamentary oversight. The government and the MDP are currently negotiating for the release of opposition leader Mohamed Nasheed and other jailed politicians. The opposition has backed several government proposals including the impeachment of vice president Dr Mohamed Jameel Ahmed on Tuesday and a constitutional amendment setting new age limits of 30-65 years for the presidency. President Abdulla Yameen has now appointed the influential tourism minister Ahmed Adeeb as the new vice president. His nomination will be approved by the People’s Majlis today. Comment: Whose pragmatism? Which principles? It is surprising that some have attempted to justify Wednesday’s constitutional amendment to change age requirement for the offices of president and vice president on its substance. The efforts to amend the constitution by putting an age limit for the president and vice president and by giving the powers to the president to appoint and dismiss vice president, curtail electoral rights. This includes the right to elect the vice president and the right to contest political office. These efforts are also dictated by the whims and wishes of the government of the day, not by any widely felt need for democratic reforms to the constitution. However, it is more baffling the amendment has been defended on the basis of “pragmatism”. This is because this amendment is directly related to the failure of opposition’s “pragmatism”. One is forced to wonder whose “pragmatism” does the vote serve? Nebulous words like “pragmatism” hardly clarify what the constitutional amendment is about. The amendment is not simply about the removal of the current vice president. It is about President Abdulla Yameen’s desire to fully control and perpetuate political power. The amendment is yet another attempt, on President Yameen’s part, to eliminate serious, potential presidential candidates. There was a reason why former president Maumoon Abdul Gayoom rejected it, and pointed to the unacceptability of setting age limit to 65 years. This not only disqualifies Jumhooree Party leader Gasim Ibrahim, it also disqualifies Gayoom himself, and Yameen’s long-time political rival, Ilyas Ibrahim, as presidential candidates. One is therefore forced to ask whose “pragmatism” this vote serves? Yameen could have attempted an old style illegitimate dictatorship. But this vote, with its appearance of democratic agency and a position of bargaining power on opposition’s part, seems to be typical to his type of new despotic regime, ruled through a veneer of legitimacy, fully utilising democratic discourses, formal institutions and other antics of democracy. One could therefore call the success passage of the amendment Yameen’s “pragmatism”, not Maldivian Democratic Party’s or JP’s. Political pragmatism indeed assumes the belief that one has agency and one is in a position of power to somewhat direct things. However, the opposition acted not from the belief they were in a position of power or real agency. The vote to pass the amendment was an outcome of complete disillusionment, if not distrust, in what ordinary people are capable of achieving. It was also an outcome of the belief the international community has failed to act against the rise of Yameen’s new despotism. In other words, it was an outcome of the belief there was no power and democratic agency in politics through ordinary people or the so-called international promoters of democracy. The vote is therefore not opposition’s pragmatism. It is their defeatism. It is easy to put blame on ordinary people when their mobilisation could not be sustained or the mobilisation could not achieve one’s unclear goals. Yet sustaining political mobilisation for major changes requires certain common ideals. At the very least, it requires common sensibilities and affects. From the beginning, MDP defined their political mobilisation against Yameen’s government based on “pragmatism”. For example, the alliance with JP, who had stolen the first round of presidential elections in 2013, was defended on “pragmatism” based on common “interests”. But a group capable of sustaining political mobilisation effective to bring major positive changes cannot rely on “pragmatism” based on narrow “interests” alone. A set of shared ideals for a shared political future is necessary to sustain mobilisation. The opposition not only lacked these shared ideals. It is also not altogether clear they held any political ideals individually, beyond rhetoric such as “In Defence of the Constitution” or “Aniyaverikan Ninman”. The nebulous term “aniyaverikan” to capture all the disparate interests or unclear goals of the opposition also lent itself to conceptualisation by religious leaders such as former Adalat president Sheikh Hussain Rasheed Ahmed in terms of the tripartite sins in Islam: sins against God, sins against one’s self, and sins against third parties. Short of common ideals for a shared future, such a political grouping must be, at the very least, based on common sensibilities and emotions. True, anger and betrayal might have animated many, including JP leader, businessman Gasim Ibrahim. However, one wonders if this anger and sense of betrayal have any affinity with the sensibilities shared by others. The lack of a shared future based on shared ideals and sensibilities was deeply felt from the first rally against Yameen’s government on 27 February. Some also saw even the May Day rally, the biggest so far, as a failure because of this lack of shared goals based on common ideals and sensibilities. By June 12, any doubt as to the political parties’ ability to sustain a common political mobilisation was gone. If this is so, one is left to wonder, isn’t Wednesday’s vote really a failure of “pragmatism” by the opposition? There is no proven formula for how to achieve and sustain democracy. Therefore, the matters of how to achieve and sustain democracy fall within “pragmatism” if pragmatism is about what works in practice. As the great pragmatist William James held, holding on to certain beliefs even if they could not be proven to be true provided those beliefs could bring about positive consequences, is partly what pragmatism is about. However, some beliefs as to how to achieve democracy have clearly no positive consequences. The belief in the “short walk” to democracy and the belief that the wisdom and dictates of single individuals to be sufficient to walk this walk, seem to me such beliefs. It is the public rationalisation based on these beliefs that led to Wednesday’s vote. It is not democratic pragmatism. In doing this, opposition is facilitating Yameen’s new despotism to flourish. If this so, to my mind, it is foolish (and thus “unpragmatic”) to think the most popular politician in the country will be allowed to contest in 2018 under fair terms. That is, if he is allowed at all. Azim Zahir worked at the President’s Office and Transparency Maldives. He has a Masters in Political Science from the University of Sydney. Posted on June 25, 2015 June 25, 2015 Author Azim ZahirCategories Features & Comment, PoliticsTags age limits for presidency, constitutional amendment, maldives, maldives news, pragmatism, principles5 Comments on Comment: Whose pragmatism? Which principles? The parliament today passed the first amendment to the constitution with overwhelming tripartisan support to set an age limit of 30 to 65 years for the presidency and the vice presidency. 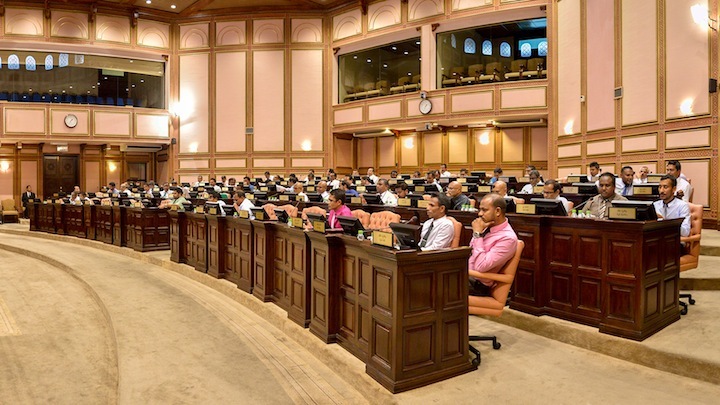 A total of 78 MPs of the ruling Progressive Party of Maldives-Maldives Development Alliance (PPM-MDA) coalition and the opposition Maldivian Democratic Party (MDP) and Jumhooree Party (JP) voted in favour of the proposed change. The ruling coalition is seeking to replace vice-president Dr Mohamed Jameel Ahmed with tourism minister Ahmed Adeeb, who is 33 and ineligible for the post. The constitution states that presidential and vice presidential candidates must be 35 years of age. Pro-government MPs have publicly accused Jameel of disloyalty and incompetence, but opposition politicians and some media outlets have claimed that President Abdulla Yameen is seeking a loyal deputy ahead of a life-threatening surgery. Several PPM MPs have said that Adeeb will become the next vice president, but Jameel can only be replaced if he either resigns or is impeached with a two-third majority of parliament. The revision to article 109(c) marks the first time the constitution has been changed since its adoption in August 2008. The change will take effect upon ratification by the president. The amendment was passed with 78 votes in favour and two against. Independent MP Ahmed Mahloof and JP MP Ali Hussain cast dissenting votes. Mahloof said in a tweet last night that he would vote against the amendment. “I respect JP and MDP’s decision,” he added. 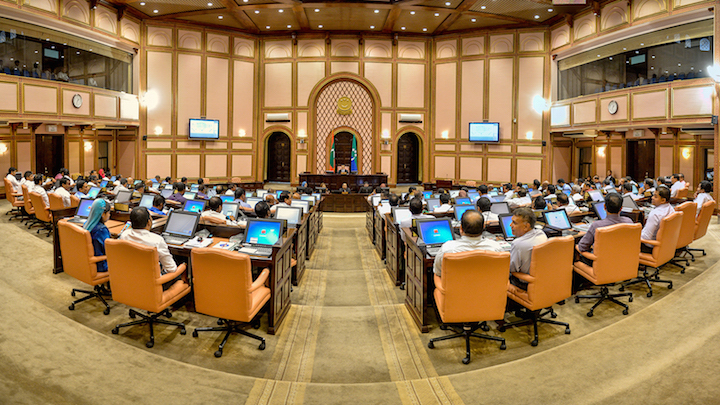 The support of MDP and JP MPs was necessary to pass the amendment as the PPM-MDA coalition has 48 seats in the 85-member house and a three-quarters majority or 64 votes was needed to amend the constitution. The MDP and JP parliamentary groups issued three-line whips last night for its MPs to back the amendment, prompting speculation of a deal with the government after former President Mohamed Nasheed’s house arrest was extended to eight weeks last night. 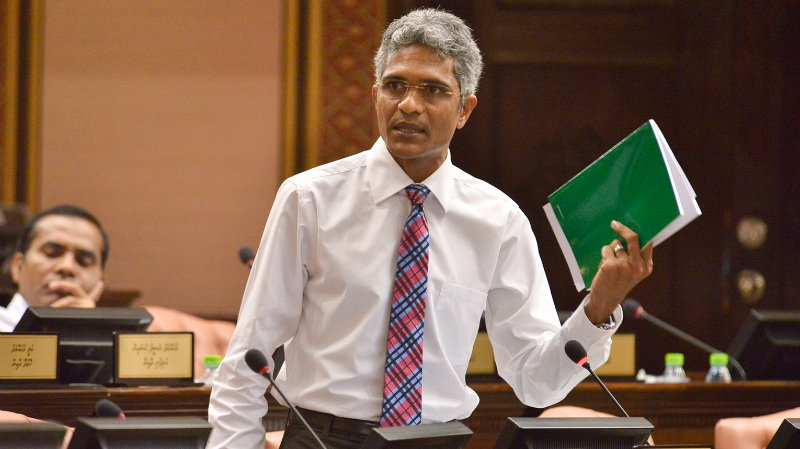 MDP parliamentary group leader Ibrahim Mohamed Solih has said that the main opposition party stood to gain more from backing the amendments than opposing it. Nasheed, who was serving a 13-year prison sentence at the high-security Maafushi jail, was transferred to house arrest on Sunday. President Yameen authorised the transfer. 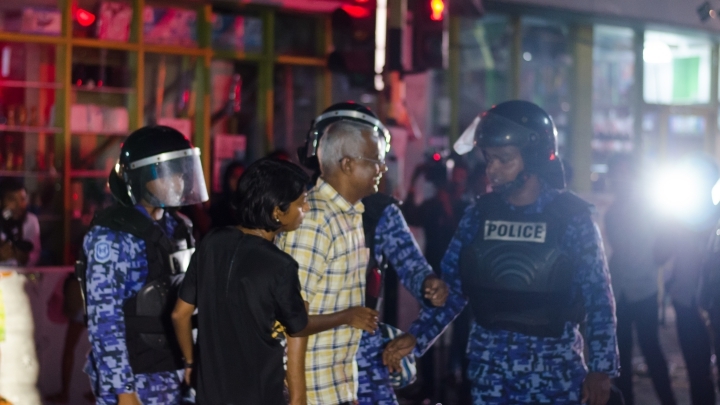 Nasheed’s arrest in February and subsequent conviction on terrorism charges triggered a political crisis with daily protests, mass anti-government demonstrations, and hundreds of arrests. JP leader Gasim Ibrahim, who has been out of the country since late April, had urged JP MPs to vote for the amendments and announced his retirement from politics. The amendments bar the business tycoon from contesting the 2018 presidential election as he would be 66 years at the time. The government has frozen the bank accounts of Gasim’s Villa Group and several subsidiary companies over US$90.4 million allegedly owed as unpaid rent and fines. Two senior JP members, Ameen Ibrahim and Sobah Rasheed, are meanwhile overseas in self-imposed exile after the prosecutor general pressed terrorism charges against the pair in the wake of a mass protest on May 1. The JP leaders along with Adhaalath Party president Sheikh Imran Abdulla are accused of inciting violence at the 20,000-strong anti-government rally. During today’s sitting of parliament, PPM MP Ahmed Nihan said ruling coalition MPs will not speak during the final debate on the amendments. MDP MP Ibrahim Naseer said he backed the amendment as the party has issued a three-line whip for the vote. The MDP has always advocated increasing opportunities for youth, he said, and lowering the age limit for presidential candidates would enable young people to reach the highest office of the state. No other MP asked to speak during the debate. The apparent deal between the government and opposition parties has divided opinion among opposition supporters and sparked debate on social media. While some have condemned amending the constitution to benefit an individual and accused opposition MPs of abandoning principles, others argued the possible release of opposition politicians would justify the move. Yes. It is a deal. A deal of the party not of individuals. Will it benefit ..I don’t know I hope it will. MDP MP Fayyaz Ismail and MDP chairperson Ali Waheed defended the party’s stand, but former attorney general Husnu Suood questioned its wisdom. Did JP sell its vote to let its leader to come to Maldives? Did MDP sell its votes for 8 weeks of house arrest? Goodness. Go get a life. JP MP Ali Hussain suggested that the opposition has capitulated while JP deputy leader Dr Hussain Rasheed Hassan said the MDP and JP has made a “mockery” of supporters who came out to protest under the ‘Maldivians against tyranny’ banner. Find MDP’s decision unwise, but more unwise to abandon the ship when it needs us most. Don’t let disillusionment get the best of you #KKBK. Former president Mohamed Nasheed’s temporary transfer to house arrest has been extended as opposition parties announced tonight support for a constitutional amendment setting new age-limits for the presidency. A family member has confirmed Nasheed’s three-day house arrest was extended to eight weeks, after a doctor advised a stress-free environment and rest for back pain. The opposition leader is serving a 13-year jail term on a terrorism conviction relating to the arrest of a judge during his tenure. The rushed trial was widely criticized for its apparent lack of due process. MPs of the opposition Maldivian Democratic Party and the Jumhooree Party (JP), at separate meetings, decided to back a ruling coalition proposed law to set an age limit of 30 – 65 years for the presidency. 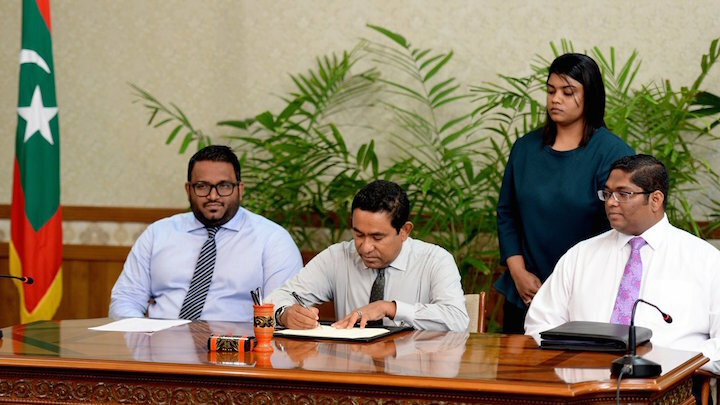 The decision has fuelled speculation of a deal between the government and the MDP conditioning backing for the amendment on Nasheed’s transfer to house arrest. Nasheed’s imprisonment has triggered a political crisis with three months of daily protests, historic marches and arrests numbering in the hundreds. Several foreign governments and the EU have called for his release. The ruling Progressive Party of the Maldives (PPM) is seeking to replace vice-president Dr Mohamed Jameel Ahmed with tourism minister Ahmed Adeeb. Adeeb is 33 now and ineligible for the vice-presidency as the Constitution states candidates must be 35. PPM MPs have accused Jameel of disloyalty and incompetence, but opposition politicians and some media outlets have claimed President Abdulla Yameen is fatally ill and is seeking a loyal deputy ahead of a surgery. The government has previously dismissed rumors regarding the president’s health. The amendment is up for the vote at Wednesday’s sitting. A three-quarters majority or 64 votes will be required for it to pass. The PPM and its ally the Maldivian Development Alliance only control 48 seats of the 85-member house. The JP has 11 MPs while the MDP has 22 MPs. The JP, at a parliamentary group meeting, issued a three-line whip. Only seven of the 11 MPs reportedly attended the meeting. Gasim Ibrahim, the JP leader and MP for Maamigili, is out of the country. The tourism tycoon has urged JP MPs to back the amendment and announced he will retire from politics when his five-year term as MP expires in 2019. The government has frozen several accounts of companies belonging to Gasim’s Villa Group after slapping a US$90.4million fine claiming the money is owed in unpaid rents, fees and fines. The MDP decided to back the constitutional amendment at a national executive council meeting tonight. Even if the amendment passes, Dr Jameel can only be replaced if he resigns or if he is impeached with another two-thirds majority in the parliament. The Department of Correctional Services extended Nasheed’s house arrest to eight weeks tonight following a consultation with a neurosurgeon at the ADK hospital, a family member said. Nasheed, who was previously held at a high security jail in Maafushi Island, was transferred to house arrest on Sunday. President Yameen authorized the transfer. An unnamed senior government official told newspaper Haveeru that the extension came on the doctor’s recommendation. “The doctor, after doing an MRI, has recommended [Nasheed] two months of bed rest. The neurosurgeon says he needs bed rest and a stress-free environment,” he said. 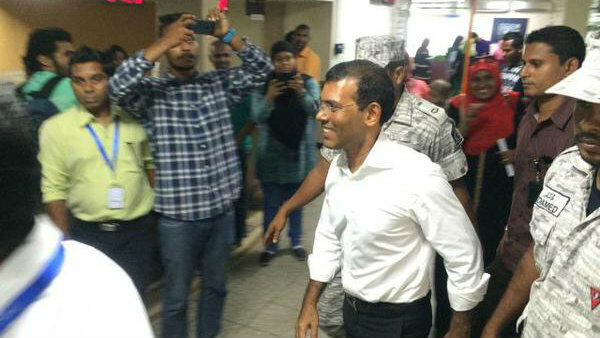 Nasheed was brought to Malé on Sunday nearly a month after a doctor first recommended an MRI scan. President Yameen has ruled out negotiations over Nasheed’s release in talks with opposition parties, and has recently rejected a clemency plea. MPs of the ruling coalition have backed a constitutional amendment setting age limits for the presidency against the wishes of ex-president Maumoon Abdul Gayoom. Gayoom, who heads the ruling Progressive Party of the Maldives (PPM), had sent a letter to the party’s parliamentary group leader Ahmed Nihan stating that MPs should wait on approval from the PPM executive council before supporting the amendment. However, at an emergency meeting tonight, MPs of the PPM and its ally the Maldivian Development Alliance (MDA) decided that the parliamentary group does not require approval from the council. The amendment – proposed by MDA MP Mohamed Ismail – proposes setting an age limit of 30 to 65 years for the presidency. The constitution currently only says a candidate must be 35 years of age. 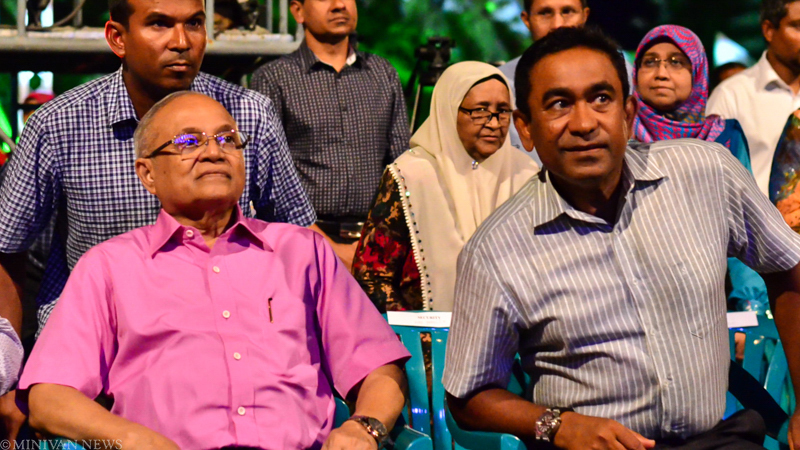 If passed, the bill would bar Gayoom from contesting presidential polls. The former president, who is now in his early 80s, had served six terms from 1978 to 2008. Shortly after the message was sent, some 44 MPs voted to consider the amendment and sent it to a sub committee for review. The parliamentary committee has since voted to accept the bill. It will now be sent to the parliament floor for approval. The bill has fuelled speculation that President Abdulla Yameen plans to replace vice-president Mohamed Jameel Ahmed with tourism minister Ahmed Adeeb, who is now 33 and ineligible for the position. The relationship between President Yameen and Dr Jameel is reportedly under strain. Jameel’s cousin, Mohamed Maleeh Jamal, was dismissed from the cabinet last month. The government did not provide a reason for the dismissal. Yameen is currently in Germany in an unannounced visit and is due back on Sunday. A three- quarters majority or 64 votes will be needed to amend the constitution. The ruling coalition controls 48 seats in the 85-member house, and will need the backing of the opposition Maldivian Democratic Party (MDP) and the Jumhooree Party (JP). A three-quarters majority will also be needed to impeach Jameel. 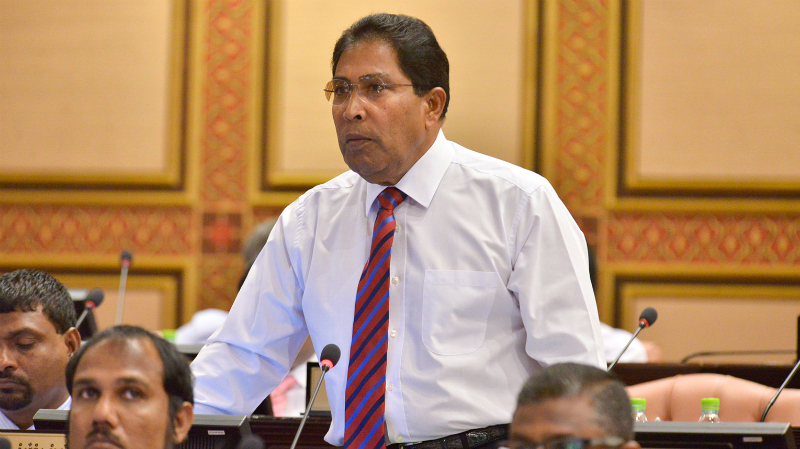 JP leader Gasim Ibrahim has urged the nine JP MPs to back the amendment, although it would bar him from contesting the next presidential elections. He will be 66 in 2018. Gasim announced last week that he will retire from politics once his five-year term as Maamigili MP expires in 2019. The tourism tycoon’s announcement comes weeks after the government slapped a US$90.4million fine on his Villa Group and froze the accounts of five of Villa Group’s subsidiary companies. The claim was issued after the JP split from the PPM and allied with the MDP in a campaign against President Yameen’s alleged authoritarianism. Gasim has since suspended the JP campaign and remained silent on the imprisonment of MDP leader and ex-president Mohamed Nasheed. The JP is in disarray with two senior officials facing terrorism charges. The MDP, the religious conservative Adhaalath Party and several JP MPs are continuing the campaign for Nasheed’s release. The leader of the Jumhooree Party (JP) Gasim Ibrahim has urged MPs to back a constitutional amendment that would bar him from contesting the presidential elections in 2018. Gasim has been in Bangkok since late April. The amendment – proposed by a ruling coalition MP – proposes setting an age limit of 30 to 65 years for the presidency. The constitution at present only says that a candidate must be 35 years of age. “Gasim Ibrahim called some MP’s on their phones and requested that they support the amendment. He also texted some MP’s requesting support for the amendment. However the JP parliamentary group is yet to make a decision,” the JP spokesperson Ali Solih told Minivan News today. In 2018, Gasim will be 66. The amendment bill was accepted with 44 votes in favour, five against, and sent to a parliamentary committee for review. A three-quarters majority or 64 votes will be needed to amend the constitution. The Progressive Party of Maldives (PPM) and coalition partner MDA controls 48 seats in the 85-member house. The ruling coalition will need the backing of the opposition Maldivian Democratic Party and JP MPs to pass the amendment. Several JP MPs voted in favour of the bill. The bill has fueled speculation of President Abdulla Yameen planning to replace Vice President Dr Mohamed Jameel Ahmed with tourism minister Ahmed Adeeb, who is now 33 and ineligible for the position. JP MP Abdulla Riyaz was not available for comment at the time of going to press. The criminal court has meanwhile said they are not aware of an arrest warrant for Gasim. Newspaper Haveeru in early May reported the court had issued an arrest warrant for Gasim on charges of funding the opposition’s May Day protest. A second meeting between JP representatives and the government on Sunday has also been postponed. JP MPs met with cabinet ministers on June 9, to begin talks proposed by President Abdulla Yameen, and proposed conducting talks with all the opposition parties and the ruling Progressive Party of the Maldives (PPM). MPs also asked for the release of imprisoned politicians including ex-president Mohamed Nasheed, judicial independence and investor protection. President Yameen called for separate talks with the three allied opposition parties, days after the tax authority froze the accounts of several tourism companies that belong to Gasim. The government claims Gasim’s Villa Group owes the state US$90.4million in rent and fines. The opposition says the claim is politically motivated, and the Villa Group is contesting it at the civil court. Gasim in several tweets on Friday distanced himself from the opposition’s June 12 sit-in, and urged Villa employees not to participate. The JP deputy leader Ameen Ibrahim and council member Sobah Rasheed have been charged with terrorism over the May Day protest. Nearly 200 people were arrested after violent clashes broke out between the police and protesters. The pair are abroad. Sobah has said he is seeking political asylum. Ex-president Mohamed Nasheed was arrested a week after the two parties launched daily protests. He was swiftly brought to trial over the detention of a judge during his tenure and sentenced to 13 years in jail on terrorism charges. Since the tax authority issued the US$90.4million claim, Gasim has not been seen at opposition protests and has remained silent on the jailing of several politicians. MPs and senior officials of the JP, however, formed a new coalition with the MDP and the religious conservative Adhaalath Party in March. The Villa Group has struggled to pay salaries for some 5000 staff. Some have been dismissed.